More importantly, it’s a lot more fun to prepare food when you’re using a sharp knife. You’ll marvel at how accurately you can wield the edge of your knife to transform your food into whatever shape you want it to be. Santoku knives are some of the sharpest knives you’ll find anywhere. These traditional Japanese blades resemble Western chef’s knives in size and general shape. Their most important feature has to do with their edge. While normal European knives often sport grinds as dull as 20 degrees (per side), santoku knives commonly have bevels at 18 degrees or less. 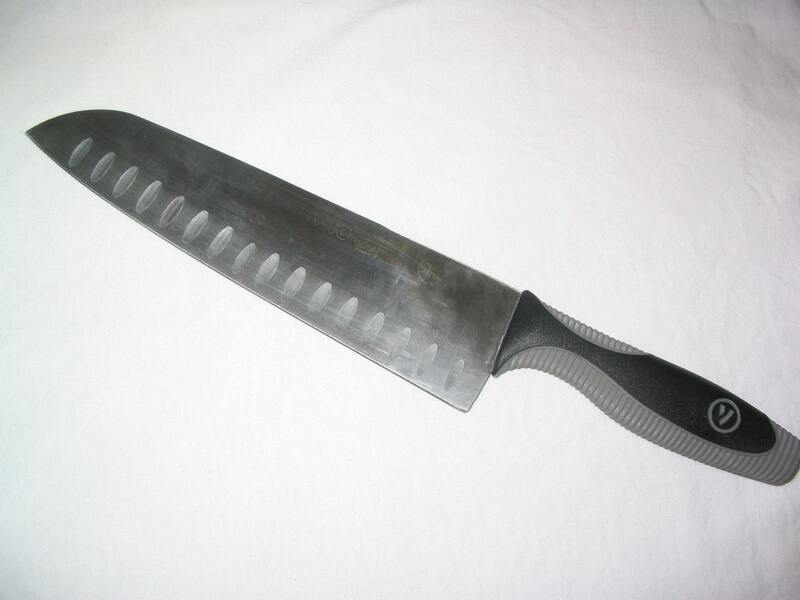 They’re sometimes hollow ground, too, which means that instead of having a straight angle from the edge of the blade, the knife is somewhat convex for a little bit. This helps santokus feel even sharper. In order to find out more, let’s check out some of the best santokus on the market today. Here are my four favorite knives, presented in no particular order. Dalstrong is a newer brand that’s made a big impact in the world of culinary knives. The Gladiator Santoku offers some pretty clear insight into why their splash has been so big. This knife is simply and beautifully constructed out of high-quality HC steel. It’s designed to be eye-catching without being overbearing or gaudy. Best of all, it’s not going to break the bank. As far as high-quality, full-length santokus go, this knife is pretty affordable. This particular santoku has a 7″ blade that’s sharpened to 18 degrees per side. It’s made of German HC steel that measures 55 on the Rockwell scale. This is a bit soft as far as Japanese-style knives go, but it means you won’t have to worry much about damaging the ultra-sharp edge of this knife. You’ll be able to sharpen it quite easily, too. Santokus commonly have hollow divots, often called Granton divots, which are oval indentations placed on the side of the knife. These are thought to help keep food from sticking to your knife as you work. The Dalstrong Gladiator Santoku has a subtle rectangular variant of these divots. It’s hard to tell exactly how effective they are due to just how sharp this knife is. The blade itself is tall and has just a little bit of belly towards the tip. This is a bit non-traditional, but it’s a welcome feature in most western kitchens. It makes it possible to lapse into a rocking-style cutting pattern when you feel the need to. The majority of the blade is quite straight, however, making it excellent for up-and-down chopping. The handle is solid and well balanced. It’s made from a composite material that isn’t quite as pretty as wood, but it’s significantly easier to clean and a bit more comfortable in your hand. The bottom quarter inch or so of the knife is deliberately unsharpened to make it easier to grip. 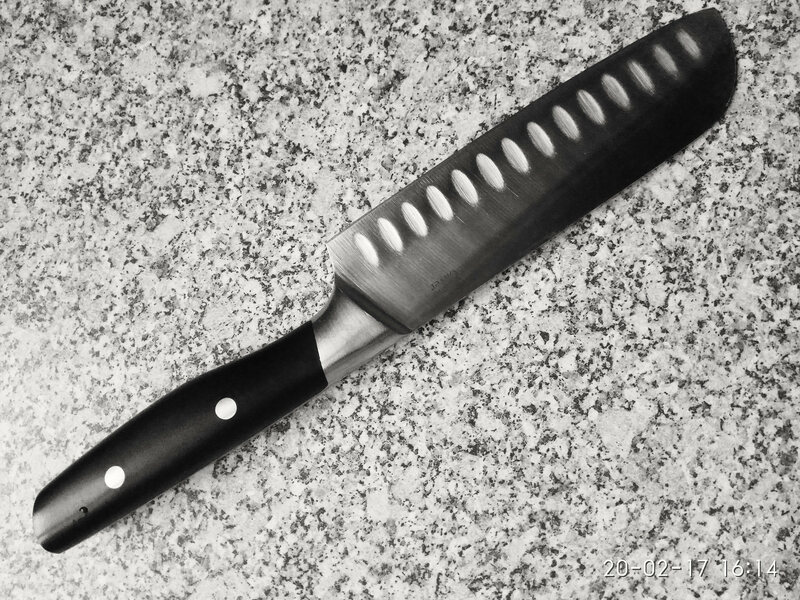 You’ll feel incredibly confident in your ability to handle this knife. Overall, this is one of my favorite santokus for just about every reason. It’s made from high-quality steel, it’s quite sharp right out of the box, it’s easy to maintain, and it’s quite accessible. 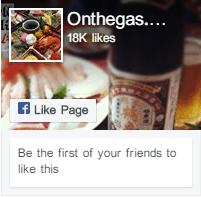 It’s also at a quite reasonable price point for its quality and features. If you want a great santoku to try out in your kitchen, the Dalstrong Gladiator is a great choice. The Dalstrong Shogun Santoku is a brilliant upgrade from the Gladiator above. It still manages to be surprisingly accessible while offering harder steel, a finer edge, and improved aesthetics. While it’s a bit more expensive, it’s a clear upgrade in many measurable ways. I mentioned earlier that santokus can get pretty sharp. This knife is a great example of that. It comes with a hand-ground edge that’s as sharp as 8 degrees per side, dulling out a bit as the blade gets closer to the handle. It comes this sharp out of the box, too, so you’ll be able to cut paper with ease or make tissue-thin tomato slices. 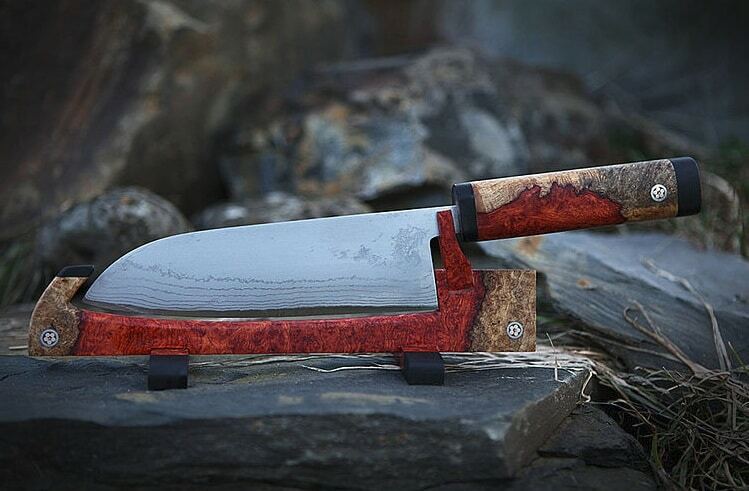 Steel is one of the most important parts of any knife, and this knife is made from very fine steel. It’s forged from AUS-10V Japanese metal, which measures at 62 hardness on the Rockwell scale. This is important because of how fine the edge is. You need a hard steel like this one in order to maintain that edge through kitchen use. The exterior of this knife sports subtle (but very noticeable) Damascus patterns. It’s clearly meant to be admired in your kitchen. Like the Gladiator knife above, the handle is made from composite and is incredibly comfortable. This knife has a little bit of belly towards the tip for rocking, just like the other Dalstrong. This means it’s pretty accessible for people who aren’t completely used to up-and-down chopping yet. On the other hand, the harder steel and finer edge are somewhat harder to maintain. You’ll want to make sure you’re very comfortable with your sharpening tools before using them on this knife. While this knife is more expensive and less accessible than the Gladiator above, the Shogun Santoku is a brilliant choice for the more serious chef who wants a sharper, more attractive knife. You’ll get an incredibly high-quality tool that will make cooking more fun for many years. JA Henckels is a famous German brand that’s been making knives for centuries. They’ve recently branched out and started to offer European takes on Japanese knives. Their santoku is solid, accessible, and quite effective. It’s not quite as sharp or hard as a traditional Japanese knife, but that doesn’t mean it’s not still an incredible tool to use for food prep. This 7″ blade is quite comparable to the Dalstrong Gladiator we reviewed earlier. It’s got just a little bit of belly towards the tip and comes with Granton-style divots up and down both sides. As far as grind goes, this fully-forged knife has an angle of about 20 degrees, making it fairly dull as far as santokus go. Still, this is a pretty typical grind for a European chef’s knife, so this knife isn’t dull at all. Instead of being made out of high-carbon steel, this knife is made out of German stainless. This makes it dishwasher safe and fairly easy to maintain. It also means the edge will suffer a bit. You’ll have trouble putting a super steep angle on this blade and maintaining it without constant work. If you’re happy with the default 20-degree grind, however, you’ll encounter no problems. The composite handle on this knife is fairly ergonomic and perfectly dishwasher safe. It’s not the prettiest thing in the world, but it’s quite nice to cook with and it won’t be damaged by being submerged in hot water. Overall, this santoku is an extremely good choice for anyone who wants a durable, easy to maintain knife they can put in the dishwasher. If you want the sharpest or prettiest knife around, however, you’ll want to choose one of the other options here. This shorter 5″ santoku features incredibly prominent Damascus patterns and a tasteful wooden handle. It’s made by Sunlong, a Japanese company that manufactures their knives in China. This means it’s incredibly inexpensive, especially given the quality. The blade itself is made from VG-10 steel with about a 60 Rockwell hardness rating. It’s got a 15-degree grind, which is quite sharp, even when compared to many double-beveled Japanese knives. It’s ready to make tissue-paper thin slices right out of the box. In addition to the low cost of this knife, one of the biggest draws is how nice it looks. The Damascus patterns on the blade are quite noticeable and there’s a gentle wave along the edge where different types of metal meet. The handle is made of polished rosewood and is incredibly beautiful. This does make the knife a bit harder to maintain, however, and you’ll want to be careful with how you clean it. If you’re looking for a standout knife that will look great without emptying your wallet, this Sunlong santoku is an excellent choice. It’s affordable, incredibly stylish, and made from quality materials. It’s also one of the sharper knives available, meaning you’ll have lots of fun whenever you get an excuse to use it. Santoku knives are a style of Japanese knives that aren’t too different from Western chefs knives or Gyutos. They’re long, general purpose knives that excel at most tasks. There are three important features that differentiate Japanese santoku knives from other knives. First, they have fairly dull tips. They’re usually not totally flat. Instead, they have a curve that leads into a little bit of a point. Second, they have a very small amount of curve or “belly” to the blade, often none. This makes them unsuitable for rocking. Traditional santoku use involves an up-and-down chopping motion that takes the knife fully off of the cutting board with each stroke. 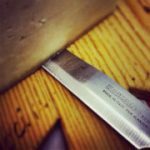 The flat blade makes full contact (or nearly full) each time, meaning you’ve got a lot more blade to cut with each time you chop. Third, santokus are very thin and crazy sharp. They often come with very, very high angle grinds, as little as 15 degrees. Many manufacturers also sell santokus with hollow grinds. This makes the knives light and means that they’re incredibly fun to chop with. Santoku knives are designed with chopping in mind. In order to chop with one properly, place your food on a large, stable cutting board. Hold your food with one hand (the one without your knife) and tuck your fingers inwards. Rest the knife blade against your knuckles and use your food hand to guide it as you chop quickly up and down. 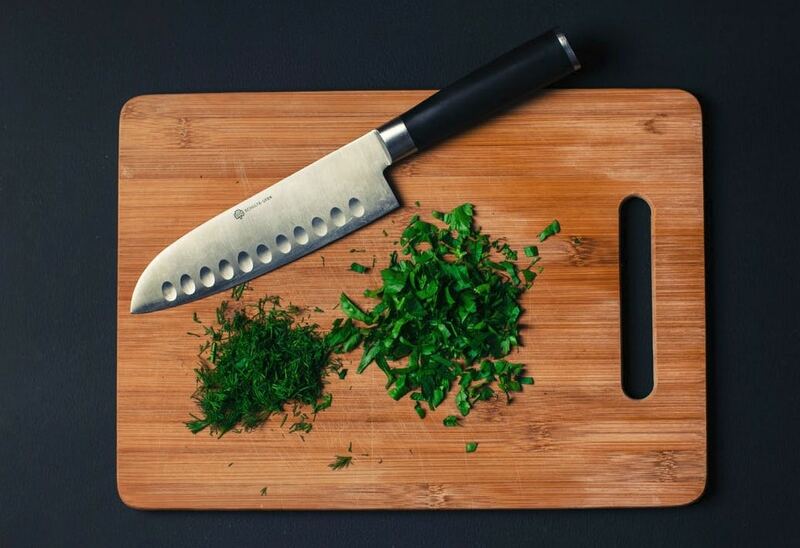 Bring the knife blade into full contact (or mostly full contact if it has a belly) with the cutting board each time. The broad blade of a santoku makes this motion particularly easy. There’s more knife for you to guide with the knuckles on your guide hand. 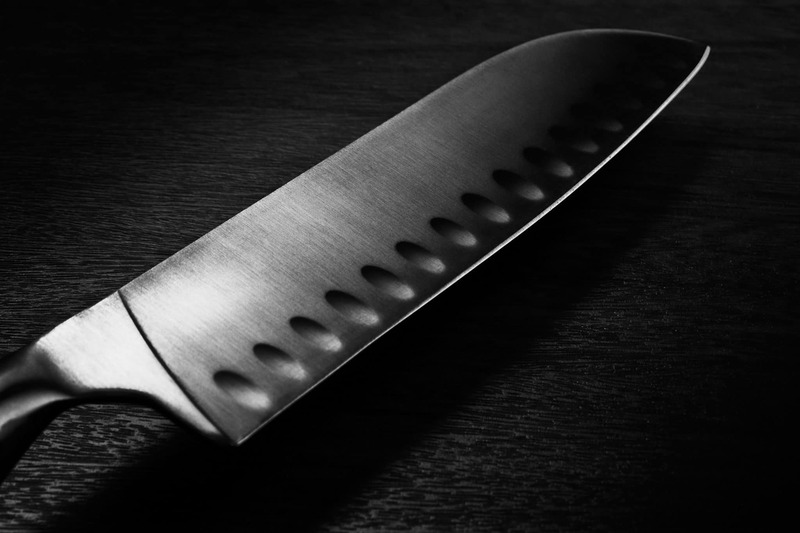 Most chefs find that bringing the knife forward and back slightly with each stroke improves their cutting power. Experiment and see what works best for you! Santokus are especially adept at slicing delicate food (like herbs) without crushing it. In order to slice with your santoku, try using a back slice technique. Gather your food into a clump with one hand. Curl your fingers underneath your knuckles and use your knuckles to guide the blade to where you want it. The key to this technique is to point your knife at the cutting board and lift up the tail end slightly. Let the tip rest on the cutting board. Then, draw the full blade across your food while maintaining the slight angle. You’ll be able to deliver quick, precise cuts without any crushing force at all. When force is appropriate (like with onions), you can modify this technique to cut food faster. Instead of moving the blade backward without pushing down, place it on top of your food with the tip against the cutting board and move it forwards while applying downward pressure. As usual, use your knuckles, on one hand to guide the blade and make precise cuts. While I’m a big fan of Dalstrong knives, the best santoku knife for your kitchen will depend on your needs and desires. The Dalstrong Shogun is a very sharp, pretty knife that’s perfect for experienced chefs, while the Gladiator santoku is a bit more forgiving and somewhat cheaper. If you want something dishwasher safe, there’s an excellent Spanish-made JA Henckels santoku just for you. Finally, if you want a very pretty knife that’s incredibly affordable, try the Sunlong VG10 santoku. It’s got incredible aesthetics for a very low price.